Even though the film centers around the tragic case of Jennifer's brutal killing, the storyline encapsulates so much more with the relentless fight put up by her mother, Julita, to bring justice to her daughter. Director PJ Raval's "Call Her Ganda" is a powerful non-fiction investigative documentary about the murder of a Filipina transwoman at the hands of a teenage American Marine and how three women — deeply affected by the killing — fight to seek justice from a foreign superpower. The film, which comes across as an amalgamation of a murder mystery, a courtroom drama and trans-rights activism, also throws light on the deeply troubling post-colonial relationship of the United States with its once colony, Philippines. Joseph Scott Pemberton, a 19-year-old American Marine, took shore leave in Olongapo City, Philippines in October 2014, where he met Jennifer Laude, a 26-year-old Filipina transgender woman at a bar. The duo subsequently went to a motel room where Laude was later found dead: half-naked, neck blackened with strangulation marks and her head submerged in a toilet bowl. Pemberton was declared the prime suspect in the case and the possible motive was concluded that the Marine was surprised to learn Laude was a transgender and not a woman, and apparently snapped and killed her in a fit of rage and humiliation. A picture of Jennifer Laude can be seen in her house in a still from Call Her Ganda. Even though the film centers around the tragic case of Jennifer's brutal killing, the storyline encapsulates so much more with the relentless fight put up by her mother, Julita, to bring justice to her daughter. Julita, who called her daughter 'Ganda' — meaning 'beautiful' in Tagalog — struggles with her loss and pain but still perseveres and finds herself spearheading the trans activism sparked by Jennifer's murder in the country. Julita's battle for justice is aided by Virgie Suarez, a lawyer working pro bono, and an American-Filipina trans journalist, Meredith Talusan, who see the bigger picture than just a simple murder case here. 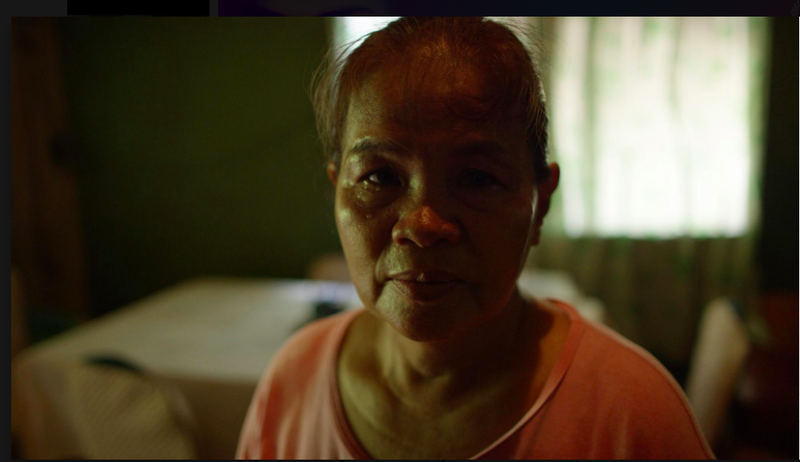 Jennifer's mother Julita Laude looks at the camera in a still from Call Her Ganda. "When I heard the story of Jennifer Laude, I was moved by several things. Mostly, I was very moved by Jennifer’s mother and the way she passionately took on the world, which showed the love she had for her daughter," the film's director, PJ Raval, a queer Filipino American himself, tells Meaww. "I saw her and I thought here is a great example where Nanai ('mother' in Tagalog), a woman from a very poor and uneducated background is standing up and declaring her love for her child and saying that she will persevere till the end. At the end of the day, if there is any light at the end of the tunnel, it’s Nanai who stands as a shining example as someone who finds their political voice, who starts to wield their power as a citizen, as a woman, and as a mother," Raval says. Director PJ Raval (C) attends the premiere of 'Call Her Ganda' with Meredith Talusan (L) and Virgie Suarez (R) during the 2018 Tribeca Film Festival at Cinepolis Chelsea on April 19, 2018 in New York City. The film also portrays transphobia and the culture of victim blaming with Raval showing clips of a newscaster referring to Jennifer as "Jeffrey, who dressed like a woman," or when Pemberton is quoted by a fellow marine as saying: "I think I killed a he/she" when he returned to the base. The general bile towards the LGBTQ community is shown in the film through a montage of hateful comments on social media about Jennifer, where many wrote that she deserved to be killed since she hid her true identity as a transgender from Pemberton. An absurd line of defense is also provided by Pemberton's mother, who tells a journalist that her son is not biased towards transgender people because his sister is a lesbian. On asking why the film does not clearly present Pemberton's line of defense or even interviews from his mother, Raval tells us that for him this film is not about the American Marine. "I feel like I have seen so many films trying to sympathize with the superpowers or trying to sympathize with people in power. For me the film is not about whether Pemberton is guilty or not, there has been an admission of guilt, the real question is why he says he did it," the director says. Joseph Scott Pemberton seen in a still from Call Her Ganda. "For me, this story is really about whether these women will see the accountability of the crime that has been committed, and as women and trans women in the Philippines, it is a very difficult journey for them. The film is about us seeing their experience and all the hurdles they have to face to find justice. I am not interested in making a he said, she said kind of storyline. That is a disservice to the story itself. For me this story is about a group of willful women and how they are going to take a foreign superpower to seek justice and accountability. I know plenty of people would want me to make a film on Pemberton, that is the last thing I need to be doing. I don’t need to make a film about the colonizer. This story is from the perspective of the marginalized, it’s their story." The film also heavily focuses on the controversial Visiting Forces Agreement (VFA) reached between the United States and the Philippines. The agreement dictates that the US government will retain jurisdiction over military personnel accused of committing crimes in the Philippines, allowing the accused to avoid local prosecution and imprisonment. The agreement also states that the accused will be taken out of the Philippines under the care of the US military if a court case isn't brought within a year of the crime. We see the women in the film race against time, fearing Pemberton would be handed to the US — as his attorneys employ delay tactics — without being held accountable for the crime. 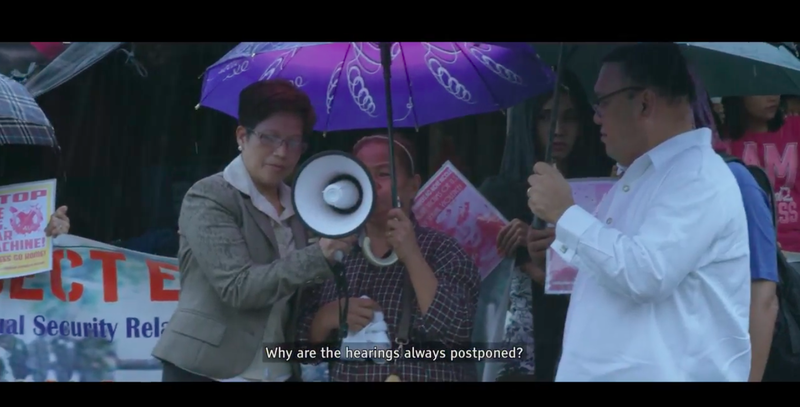 Journalist Meredith Talusan (L) takes a picture of protesters rallying for justice in Jennifer's case, in a still from Call Her Ganda. "Apart from the agreement itself, what is more problematic is that there is no clear language on what happens if there is a conviction, which already shows that there is probably an assumption that these people would never be convicted," Raval says. "This is clearly the first time it has been challenged. I think people would never know about it unless it’s brought to attention. The story not only highlights the holes in the agreement but also the rationale behind it and the reason it exists in the first place. I don’t think it is fair to the Philippines as a country and I don’t think it was intended to be so." Jennifer's case brought the unfairness of the VFA to the fore with numerous anti-US protests breaking out in the Philippines, with one clip showing protesters chanting: "No Trump, No VFA, No fascist USA." The director also shows a segment featuring Rodrigo Duterte's election as the country's president in 2016 and his condemnation of the US and its intrusive role in the Philippines. Jennifer's mother speaks in pouring rain during a protest held outside the court after the hearings on the case are postponed. 'Call Her Ganda', in all, is a heartbreaking narrative of how Jennifer and Pemberton epitomize the communities they represent: the colonized and the colonizer. Where Jennifer mirrors the marginalized Filipina transgender community, Pemberton embodies imperialism and transphobia and an absurd sense of superiority, and their encounter tragically illustrates the ensuing abusive relationship of the Philippines and the United States.